As Christmas approaches, everyone prepares in their own way. And although we may all get ready differently, the end result is much the same. When Christmas comes we all gather to share the joy together. My Merry Christmas is a deceptively simple story told with sparse, well chosen text. There are three to four words on every double spread, accompanied by beautifully illustrated animals – bold, yet gentle and soft. The text and illustrations go hand-in-hand, with as much of the story is told through the pictures as through the words – just as I’ve come to expect from this well known author/illustrator team. My Merry Christmas is perfect for the very young. It expresses a wonderful message about the festive season. 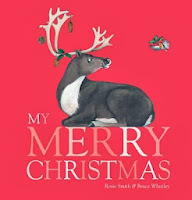 If you only buy one Christmas book this year, make it this one!